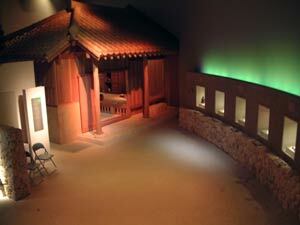 Over the centuries, Okinawa has become quite well-known for its cultural heritage and art. One of Okinawa's most distinct and well-known art forms is pottery, and the center for the pottery movement is Tsuboya. For more than 300 years, Naha's Tsuboya district has been the symbol for Okinawa pottery. It has produced many famous craftsmen who have gained fame and reputation far outside of Okinawa. The pottery made in Tsuboya is known as tsuboya-yaki. Yachimun Dori (Pottery Street) is lined with a number of tsuboya-yaki shops where the finest craftsmen still work and live to this day. Also on this street sits the Tsuboya Pottery Museum. If you would like to see some of the greatest pottery ever produced or learn about the history and manufacturing techniques of this great art form, this is the place to get your feet wet. Two types of tsuboya-yaki are produced in Tsuboya: Joyachi, and Arayachi. Arayachi is a kind of tsuboya-yaki that is unglazed or coated with mud or manganese glaze. It includes large items such as storage jars for water, bean paste, or awamori (Okinawan liquor), and small items such as masu-bin, a bottle for measuring awamori. Joyachi is another kind of tsuboya-yaki that is glazed and often very colorful. It includes bowls, pots, plates, teapots, awamori hip flasks, and vases. About 6,600, years ago, earthenware first made its appearance on Okinawa changing the islanders' cooking methods from eating raw and grilling to simmering. Though mainly influenced by the pottery of Kyushu in southern Japan, dark gray kamwi-yaki of Tokunoshima island as well as Chinese ceramics were introduced to Okinawa in the 12th century adding to its future shape and form. Chinese ceramics were imported to Okinawa beginning in the 12th century. This importation reached its peak from the end of the 14th century to the beginning of the 15th century during the time when each of the three kingdoms of Okinawa's Sanzan period-Hokuzan, Chuzan, and Nanzan--were trading with China. In the 15th century, Korea, Thailand, Vietnam, and Japan joined in the trade with Okinawa, and in the 16th century, when the import of foreign ceramics declined, several kilns were built on Okinawa to manufacture various items that were no longer being imported. The district of Tsuboya got its start in 1682 when Okinawa's three pottery districts--Chibana, Wakuta, and Takaraguchi--were integrated into Tsuboya by royal decree of the Ryukyuan empire. The need for pottery had increased greatly due to busy trading with China and other countries, and a larger production base was needed to satisfy the demand. Also, the manufacturing of tiles had been in great demand, and this policy was designed to promote and encourage increased output. The name Tsuboya was given to the district in this historical event. In the Okinawan dialect, "Tsubo" means pot and "Ya" means specialists. After Japan abolished Okinawa's feudal government and established prefectures under the new Meiji government, Tsuboya kilns administered by the royal government came to be managed privately. However, ceramics dealers from the mainland brought their trade to Okinawa, gradually replacing joyachi as daily utensils, and arayachi was also negatively affected. As the dealers of Japanese porcelain extended their business to Okinawa, the market for joyachi was depressed. Japanese porcelain was less expensive and sturdier than Tsuboya-yaki, so ceramics from the mainland became more popular than tsuboya-yaki for domestic use. However, during the Taisho and Showa periods a delegation from the Japan Folkcraft Association visited Tsuboya to study and produce pottery. They were greatly impressed by the fact that Tsuboya artisans still cherished the traditional techniques of manufacturing even while the market was being negatively impacted by the importation of Japanese porcelain. This positive reevaluation by the folkcraft movement helped in the regaining of confidence and pride by the Tsuboya potters. As World War II broke out and the war situation gradually worsened, supplies from the mainland tended to be short. Thus, the Japanese army in Okinawa began to requisition local goods. Tsuboya's craftsmen were commissioned by the Japanese army to make countless saucers and battery cases for the Japanese military. After the war, because of a chronic shortage of necessities, Tsuboya was quickly emancipated from American Occupation to produce items essential to daily life. This enabled the Tsuboya potters to resume production. These craftsmen became the first to restore Naha City after the destruction of World War II had finished. They had a very positive attitude and were very resilient in creating thousands of everyday necessities for the people of Naha City who were at the time in need of everything! After the reconstruction was finished and the city began to grow again, Tsuboya became urbanized and crowded. The Tsuboya kilns became an annoyance for some, and the town's change forced some craftsmen to move out of Naha to other spacious areas where they could fire their kilns without being in the way. Modernization became a threat to the traditional art of Naha. However, a number of craftsmen are still hard at work using electric kilns that do not produce smoke. Through the years, in spite of the importation of cheaper goods, the total destruction caused by World War II, and modernization, Tsuboya has overcome many obstacles and still remains famous on Okinawa as the center of pottery and tsuboya-yaki is viewed as a quality art form throughout the world. 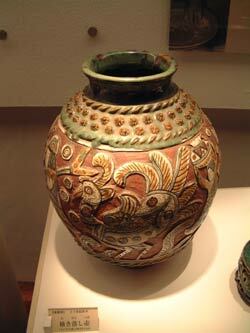 To learn more, you should check out the Tsuboya Pottery Museum. This museum gives great detail on the history of tsuboya-yaki and Okinawan pottery, the manufacturing process of various types of tsuboya-yaki, the decorative and painting techniques, and has many distinctive works on display at all times. To get to Tsuboya's pottery district, drive south on rt.330 into Naha City. Yogi park is on the left just before the Naha Police Headquarters. The Tsuboya pottery district is on the right side of rt.330 right before Yogi Park. Parking is very limited, so it is best if you park in one of Naha's many paid parking lots and take a taxi or walk from Kokusai Street or Heiwadori. The history of pottery on Okinawa is a very long and fascinating one, and the museum is definitely worth seeing if you would like to learn a bit more about one of Okinawa's most famous forms of art. 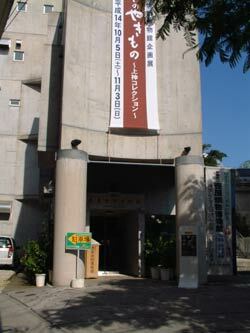 Tsuboya's Pottery Museum is open from 10 a.m to 6 p.m. and is closed on Mondays and holidays. Admission is ¥300 for adults, ¥200 for college and highschool students, and ¥100 for middle school students and younger children. For more information on, check out the Tsuboya Pottery Museum's website at himawari.naha-okn.ed.jp/~tsuboya/eigo-annai.htm.